Winter is here. Cold nights, thick morning mists and warm sunny days. 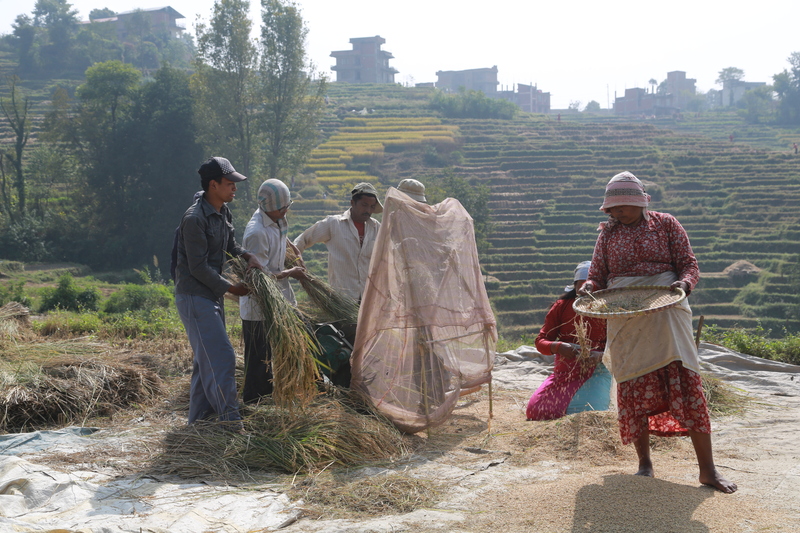 The rice has been harvested and the terraced fields, emptied of water, are harrowed and awaiting the winter crops. The leeches that thrived during the monsoons are gone and, for the first time since I moved to Kathmandu four months ago, it is possible to explore the vast amphitheater of terraced fields in front of my home and to run the narrow mud-packed paths between them. I scramble down the hill, early enough that the mist swallows me before I hit the valley. This is my little corner of heaven, free of crowds, free of exhaust fumes and traffic jams, and almost free of the city’s ubiquitous garbage. There are no stray dogs, which my Rhodesian Ridgeback, Biko, appreciates, as he can run off lead and enjoy his encounters with goats at his own speed. This is the Kathmandu of yore. Men use wooden plows and oxen to till the land. Some use hand hoes to break the hard clay soil into big grey chunks. The rice is threshed by a treadle-driven thresher or by whacking bound sheaths on the ground. Rice harvest and threshing in front of my home. Less than a mile away, the city takes over. After living in Kenya for four years, I moved with my husband John and my eight-year-old son Lucas to Kathmandu in early August. This wasn’t a simple move for me. Moving to Kenya in 2009 was a homecoming to a land where I had worked in in the mid-1990s as a New York Times correspondent. I had old friends there. I knew the neighborhoods. I knew the politics. By contrast, Nepal was a blank slate. I had visited in the early 1980s as a vagabond graduate student, but remembered little. Later, I lived in Pakistan and London. But then I had no children, no partner who ever lasted long, no schools to find, no children’s happiness to ensure. Our family living arrangements made the move harder. While Lucas and I would live in Nepal, John would commute back and forth from Bangladesh, coming home on weekends if he wasn’t pulling long haul trips to his headquarters in Washington D.C. Maybe it is age that makes it harder. At 51, I no longer travel light. My worldly belongings now travel with me crammed in 40-foot-container. Nothing is left in the US except my engagement ring (that I feared would be stolen in Kenya) and the originals of family documents. Under country of residence, I now write “Nepal.” There is a certain disconcerting finality to it. I was never a runner, and until I hit my half-century mark, my ankles and knees convinced me I needed to avoid it. But six months before I left Kenya, I concluded that the only real way to say goodbye was to run a half marathon at 5,500 feet across a wildlife conservancy. Surprisingly, I finished in the middle of the pack, not trailing at the end. Even so, in Nepal, I didn’t go running right away. The monsoon’s intense humidity weighed me down. My five-fingered Vibrams grew moldy overnight. It wasn’t as easy as following the trails in Nairobi’s fenced-in Karura Forest. 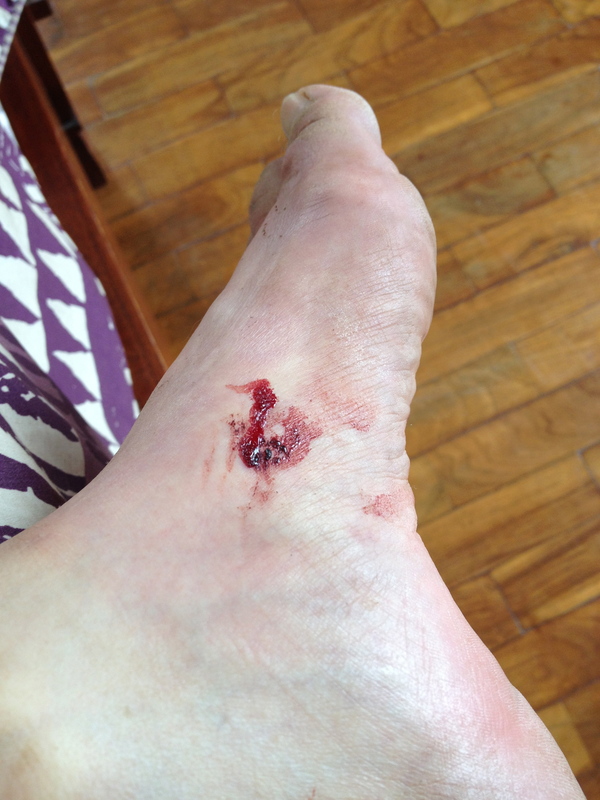 In Nepal, if I strayed off the paved road into the fields or along the rice paddies, I was forced to run along a slippery muddy parapet, and the leeches got me and Biko every time. I learned the value of carrying salt to get the leeches to drop off. Those first months were hard, not because I had no help or couldn’t figure out the lay of the land. I had wonderful guides: Keshav, a Brahmin who is also a former communist revolutionary and now our factotum, taught me everything from how to find a milk cow to where to pay electricity bills. My funny, charming and competent landlord introduced me to Buddhism, explained the black market economy, showed where to buy Tibetan furniture and briefed me on the snow depths in December treks, while school mothers gave me the tools not only to survive in Kathmandu but to thrive, eat out well and party. The problem was me. I still felt like a stranger. I’d spent 25 years as a reporter and foreign correspondent, and my grander past had a way of overshadowing my present, with oppressive results. As a reporter I felt I belonged to a group and to a place. In Nepal, I got busy hording diesel and propane gas (to safeguard against shortages) and searching for fresh mozzarella and asparagus and flaky croissants. When I feel particularly frustrated, I’ll tell John: “You know I used to be somebody before we moved the family overseas! I did other things besides preparing earthquake go-kits, attending school plays and finding out why we get three water bills a month.” Somehow I had to find a way to get beyond the logistics of navigating a new country and mastering a new language. Then I started running seriously again. I started exploring. I wrote opening paragraphs in my head, I thought up photo essays and tried to figure out what in the world I was doing in Nepal. Running means I know when my neighbors wake up and what they do. One is a taxi driver, another parks his commuter bus almost in front of our house. I’ve peeked into the TaeKwonDo school adjacent to the police station where classes start at 6 a.m. This was my first monsoon in the mountains, the sky constantly changing, the rolling clouds shifting height and color, hanging immobile just above the ground and occasionally swallowing me for a few minutes or engulfing the nearby peaks, a vast Sistine Chapel of colors soft and threatening. By October the rains had stopped, the emerald fields grew yellow, the lush growth of summer was soon coated with thick autumnal dust that scratched my throat, and the sprawling windless city was cloaked in pollution. Now it is almost Christmas and there hasn’t been a drop of rain for months. 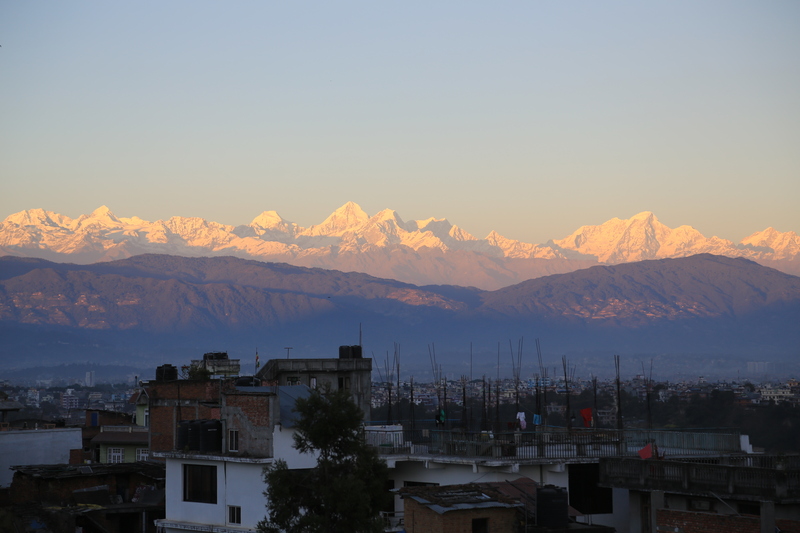 I still catch my breath every time the pollution clears and I can see a skyline of snow-capped peaks belonging to the world’s highest mountains, the Himalayas. Those days the runs are really effortless – just as long as I keep an eye out for ubiquitous pot holes, open sewers, and cow dung on the roads. Sometimes running the paddy dykes is a balancing dance, with my arms stretched out. I notice an everyday life that I have never seen before. Packs of stray rutting dogs chasing a female, hay stacks sandwiched in between modern houses, waddling ducks everywhere that like everybody else here never give way to oncoming traffic. Two of them – Lucas has named them Ping and Metaphor – call our driveway home. It’s the Kathmandu Valley and I’m home. 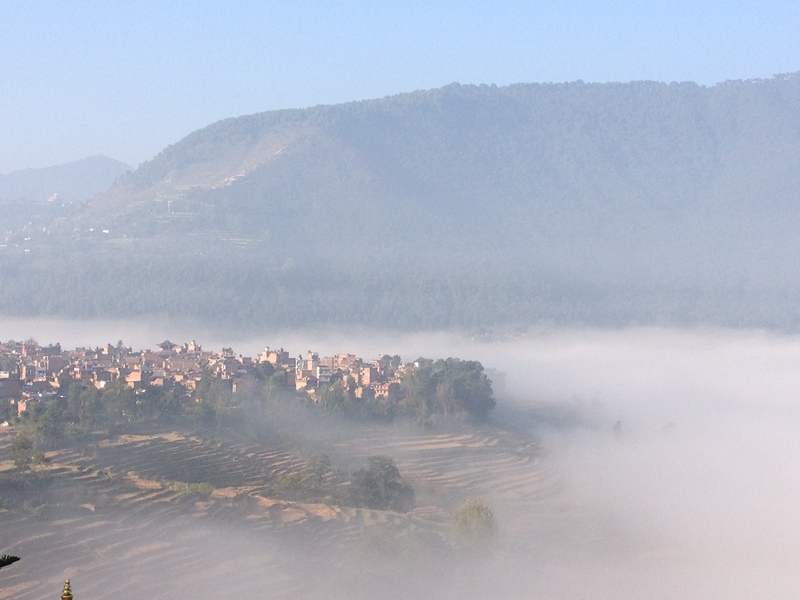 This entry was posted in Uncategorized and tagged Morning mist around the town of Khokana. on December 12, 2013 by Donatella Lorch.